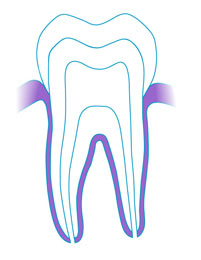 Periodontics is part of restorative dentistry and is the treatment of the supporting structures of the teeth namely the gums, bones, the hard connective tissue covering the tooth root (cementum) and ligaments. Periodontal disease (gum disease) is caused by bacteria found in the plaque that forms on teeth. This disease is not so serious when it is called gingivitis and symptoms include inflammation of the gums which can lead to bleeding when brushing. The good news is, gingivitis can be reversed and gum health will improve with correct tooth brushing. Usually, your Dental will refer you to the Dental Hygienist, who is specifically trained in cleaning the teeth, they are also expert at teaching you how to look after your teeth and gums. If gingivitis is not reversed, it can progress to periodontitis which results in destruction of the gum tissue and ligaments that connect teeth to the bone – this may eventually lead to tooth loss. Levels of periodontitis also increase with age and this is irreversible. Treatment is aimed at reducing the rate the disease progresses with the aim of keeping teeth intact.